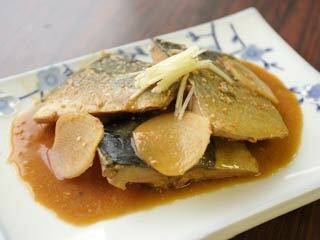 Saba no Misoni, or miso flavored mackerel, is popular simmering dishes in Japan. It is great food especially when mackerel is good in the season. It goes great with rice. First, cut mackerel 5cm each. Put mackere in a tray, and add little salt. Leave them about 5 minutes until water come out from mackerel. Then, cover mackerel with kitchen paper and pour boiled water. Mackerel is ready to cook. Make 5 of sliced ginger. Prepare a big pan and add water (500cc). Then, add Sake (3 table spoons). Add, Soy Sauce (2 table spoons). Add Mirin (2 and half table spoons). After sauce get boiled, change heat to small and put mackerels. The skin side goes up. Use small cover, called "otoshibuta" in Japanese, and put it over mackerel. This helps mackerel not breaking a part and sauce soak into mackerel. Boil it about 5 min. with a medium heat. Then remove Otoshibuta, stop the heat and add Miso. Put half of white and red miso (2 table spoons each) into a bowl. Then, pour the sauce from the pan and melt them in the bowl. Then, pour into the pan. This is better and easier. Put Otoshibuta again and use small heat cook it. Never let it boil. Just heat it for 5 min. Add another half of miso and heat little more. While waiting miso to cook, prepare sliced ginger. Peel and slice it like this. Saba Miso is ready. Let's put them on a dish. Pour the miso flavored sauce, the put sliced ginger.